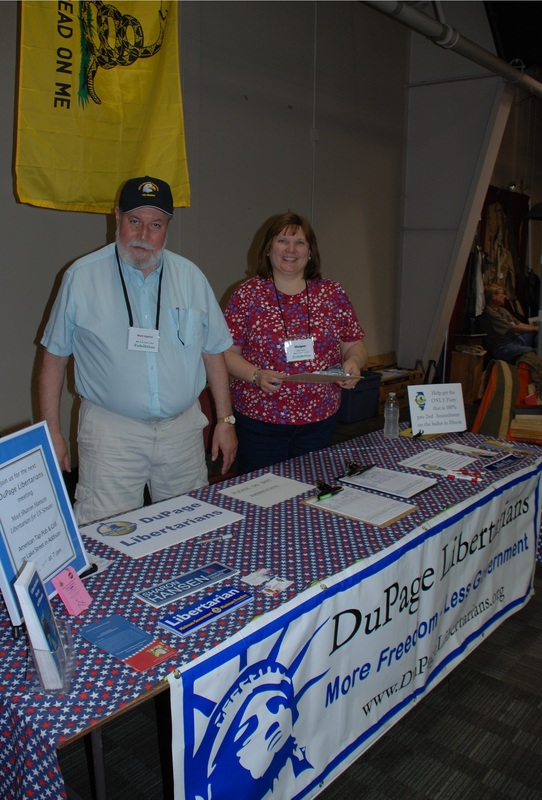 ← DuPage Libertarians More Active Than Ever!! 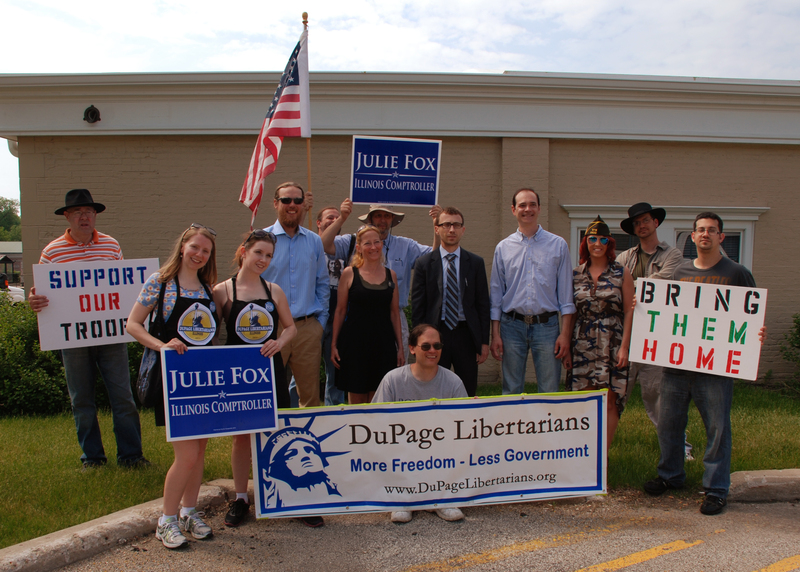 There is something for everyone to do with the DuPage Libertarians, and I do mean EVERYONE. You don’t need to have specialized technical skills, huge finances to run a campaign, or super-human powers to be an active member of a local political group. All you really need is a little free time and the willing drive to have some fun with like-minded people. Being concerned about our state running up massive debt, the county abusing property rights or your village raising taxes doesn’t mean that our work is boring and complicated. Our meetings are not full of angry people rioting against the system and wrought with heavy discussion about Constitutional law. On the contrary – our meetings are generally full of fun discussions, craft beer and lots of laughter. Everyone who wants to be heard at our meetings has a voice. So what have we done in the last month? Well, first there was the HUGE Petition Drive Fundraiser, where people from across the state came to meet our candidates and bid on unique and interesting items in an auction, while enjoying good live music. You can read all about it in our last blog. There was also an antique weapons show, full of collectors of all kinds checking out guns from WWII and swords from the American Civil War to much of the modern stuff of today. We had a booth where we greeted people, introduced ourselves and even managed to score some signatures in these final weeks of the Petition Drive. Members even met up for small petitioning events; a race in Darien, a train station in Downers Grove, a farmer’s market in Frankfort. Spending an hour or two with friends and fellow members to help out the party can be a great experience. 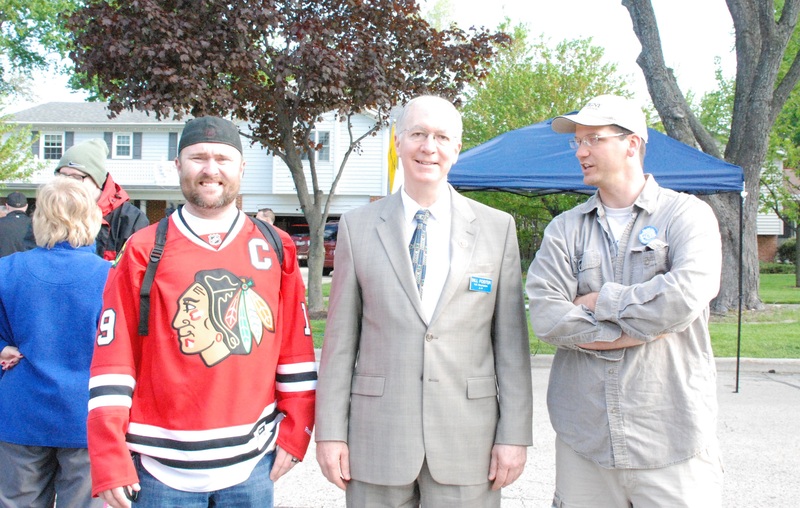 A few of us even met other local politicians, including Representative of the 11th Congressional District of Illinois Bill Foster. The easiest and most fun filled event was hands down the Memorial Day Parade in the Village of Itasca. Four of our candidates came out and marched with us down the side streets of beautiful Itasca to greet her citizens. If there was ever an event for friends, members and volunteers to jump on board with, this was it. It doesn’t get much easier or more fun to promote your local political group than this. Candidate for Lt. 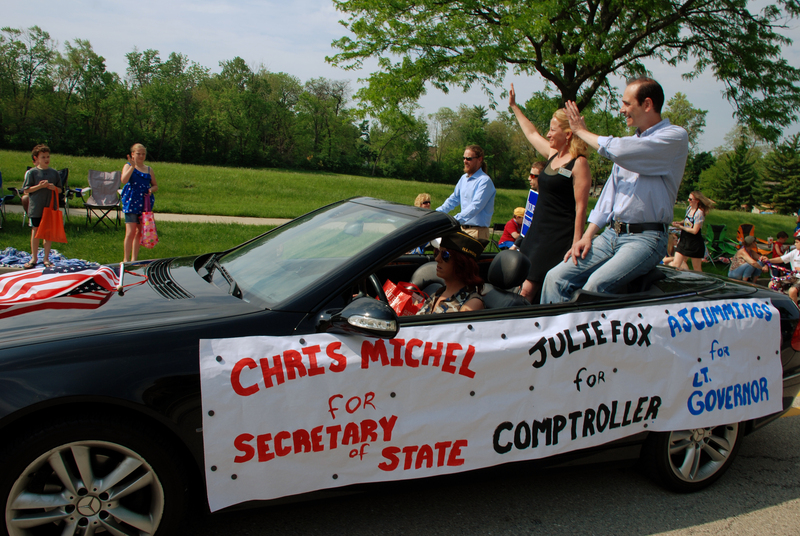 Governor AJ Cummings and candidate for Comptroller Julie Fox rode comfortably in the back of a convertible, waving to people and saying hello. Candidate for Attorney General Ben Koyl walked alongside the car, carrying signs and greeting people on the curb, while candidate for Secretary of State Chris Michel walked with his wife and three children – two of whom were on their bikes, whizzing around decorated in red, white and blue. The rest of us supported them when needed and promoted the group – David carried our banner at the head of the fleet, Jay and Steve carried signs to support our troops, Thomas kept the American flag held high and I spoke directly with the people about who we were and what we stood for. Claire and Linda, each who hold a title of Chair for their respective townships in DuPage, made cute matching outfits promoting the DuPage Libertarians and stuffed their pockets with candy to hand out to the kids. They barely had enough, running out just as we hit the end of the parade route. Afterwards, a group of us met back at my place where we grilled some food and talked about the entire weekend, which also included a parade in Dundee with Julie Fox and the Fox Valley Libertarian Party. We all accomplished a lot. We have more parades coming up on Independence Day, and in several towns increasing the chances of one being close to you. At the end of June, we have a press conference in Springfield inside the capital building. The five-day long DuPage County Fair is also coming up in late July. These are all great events to join in on and help spread the word of peace, liberty and honest government through the libertarians. Come out and get active; our next meeting is Thursday, June 19th at the American Tap Pub & Grill @ 701 W. Lake St. in Addison, IL. The meeting runs from 7pm – 8:30pm, but the “meet and greet” starts as early as 6pm. Grab some food, have a drink, find out what projects and events we have coming up – and get involved! 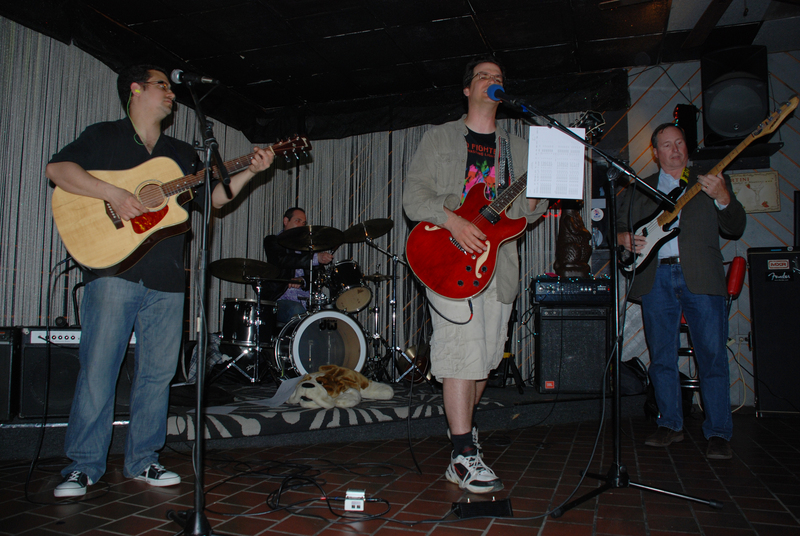 This entry was posted in activism, libertarian, Libertarian Party, Politics, Uncategorized and tagged activism, AJ Cummings, american tap, ben koyl, chris Michel, DuPage Libertarians, fundraiser, itasca, julie fox, parade, political group. Bookmark the permalink.